The Selectronic GRAND MOS is a stereo power amplifier rated at 100W per channel, and is rated for a minimum load impedance of 2-ohm. A bridge-tied monophonic version is also available, rated at 400W (8-ohm). Both factory assembled and kit versions of the amplifiers are available. The kit includes all components, hardware, and a pre-drilled and finished chassis. Although the review sample of the GRAND MOS was pre-assembled, the kit assembly guide was included in the documentation. While only 11 pages long, the manual is complete and includes color photos and drawings of the entire assembly process. All you need are a few tools, and a good digital multi- meter to set the bias. Temporary 1-ohm fuse/shunts are included for this purpose. I recommend that you have prior kit building experience since there is none of the novice hand-holding that was the hallmark of the Heathkit assembly manuals. Photo 1 shows the front panel of the amplifier, which has only a cool blue LED indicator inside the nameplate. The front panel is 9mm thick black anodized aluminum. The back and bottom of the amplifier are constructed of 2mm black-painted steel. Heavy finned aluminum heatsinks are used along each side, and the 1.5mm steel top is perforated to enhance cooling. The heatsink fins have no sharp edges to cut your hands as you move the amplifier about. The unit is very stiff and rugged, even with the top removed. Two satin-finished aluminum handles are located at each side of the rear panel for ease in lifting this heavy amplifier. The rear panel (Photo 2) has an IEC power receptacle with integral fuse and RF line filter. The unit is furnished with a heavy power cord. The power transformer primaries are factory-wired for 120V mains. The third pin of the AC receptacle is connected to the chassis. Audio signals are input to two high-quality silver-plated Teflon RCA input jacks. Two pairs of high- quality silver-plated Neutrik Speakon binding posts provide the connections for the speakers. These binding posts, in accordance with EU requirements, are not on US 0.75” spacings, so you cannot use dual banana plugs. PHOTO 1: GRAND MOS stereo amplifier front view. FIG. 2: THD+N vs. frequency. FIG. 3: THD+N vs. output power. Photo 3 shows the amplifier with the cover removed. The amplifier is a dual- mono design. Two large 500VA Huiran B-type power transformers occupy the front of the chassis. Very little interconnecting wiring is used. The two epoxy power supply PC boards use silver- plated screw connections for the eight 10,000uF reservoir capacitors and the power transformer secondary windings. Four discrete BY239 diodes per board rectify the transformer output into ±52V DC (no load) power rails. The two double-sided Teflon® amplifier PC boards are located along the sides of the unit. You can see the six MOSFETs for each amplifier channel attached to the heatsink with hex socket screws and keratherm insulators. Connections between the rear panel jacks, the power sup ply boards, and the amplifier circuit cards are made with large-gauge Teflon-covered solid wire and silver-plated screw connections. The factory wiring is very neat and should be easy for the constructor to duplicate in the kit version. A schematic was furnished as part of the GRAND MOS assembly guide. The amplifier is a true dual-mono design, sharing only the AC line input between channels. 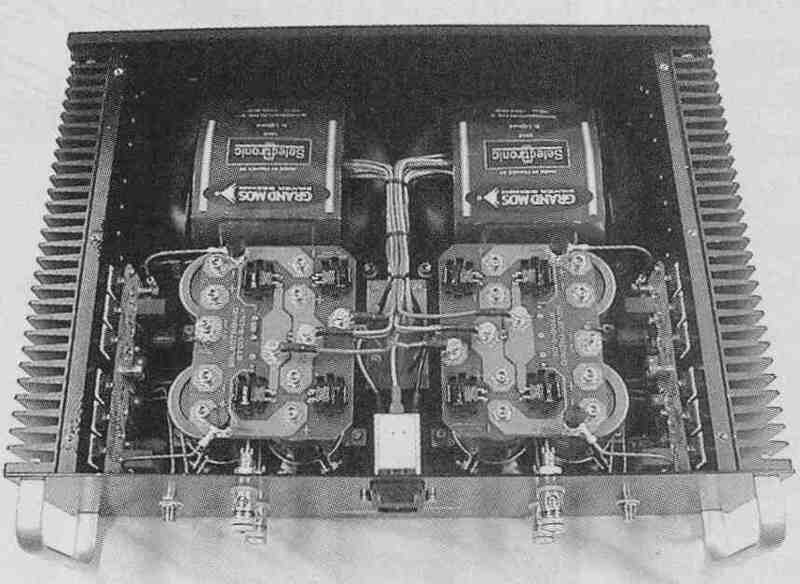 The amplifiers are electrically floated from the chassis. The input jack shell and speaker negative are connected together at each amplifier PC board, but the GRAND MOS does not share a common ground between channels as do many other stereo amplifiers. The input stage of each amplifier comprises symmetrical single-ended JFETs cascoded with bipolar transistors. Selectronic uses matched JFETs for best performance. The collectors of the BJTs are cascaded to symmetrical common-source MOSFETs that provide 31dB voltage gain and drive three pairs of parallel complementary-symmetrical source follower output MOSFETs (types J162 and K1058), with low quiescent bias current. 10pF dominant pole compensation capacitors are used at the driver/amplifier MOSFETs. Individual pots in the source of each JFET allow for adjustment of the bias. DC feedback is taken from the speaker output to the common side of the bias adjust pots at the input JFETs. There are absolutely no series capacitors in the signal path, so the GRAND MOS can amplify any DC component in the audio input signal. There is no zobel network or series R-L stability network at the output of this minimalist design. The Selectronic Triphon II amplifier we tested was a quad 16W class A amplifier packaged m a black rack mountable case The Triphon II has a companion amplifier the GRAND MOS which provides two 100W channels designed to power the woofers of a speaker system when controlled by a Triphon crossover network (see review in the August issue) When used with a Triphon crossover network, the Triphon II and its companion GRAND MOS amplifier can be used to drive independently the two woofers two midrange speakers and two tweeters of a two system Since our speakers have their own crossover networks and do not provide direct access to the tweeters and midrange speakers we used two channels of the Triphon II amplifier to drive our two channels of speakers We used an HHP CDR 800 (reviewed in Audio Electronics 2/00) to play selections from Hi Fi News and Record Re view's CD Test Disk III and directly connected it to two of four channels of the Triphon II amplifier using a passive gain control Each amplifier channel drove a NHT SL-2 sub woofer connected to a NHT Model 13 via the subwoofer s internal crossover network. We used a NAD Stereo Power Amplifier 214 as a reference amplifier and a Realistic sound level meter to set listening levels to assure that the sound levels from each amplifier were approximately the same Our listening preference put the level at approximately 72dB C weighted and measured from a distance of 12 We noted that the signal level needed to drive the Triphon II was significantly greater than that required by the NAD 214 We allowed the amplifiers to warm up for several hours before performing listening tests We could not help however playing one of our favorite CDs in the meantime. We picked a CD with our favorite clarinetist Kenny Davern titled Bob Wilbur Kenny Davern Summit Reunion Chiaroscuro CR (D) 311 The CD has some excellent brush and cymbal work by drummer Bobby Rosengarden We were immediately impressed with the sound Sandra described it as smooth Bobby Rosengarden s cymbals were very crisp and Milt Hinton s bass was deep and solid We ye noted that on some lesser amplifiers you must listen closely to discern which instrument is the clarinet and which is the soprano saxophone Not so with the Triphon II as each instrument stood out with great clarity It was like being at a front table in a jazz club but without the smoke Clearly we were impressed Our only concern was that when touching the RCA input plug in the top left rear of the amplifier we noted a buzz We noticed this phenomenon as well when touching the red speaker terminal on that same channel This did not occur when touching the corresponding connectors on the lower left rear of the amplifier We also noticed that this amplifier dissipates a lot of heat I took a laser temperature probe and measured 133° F on the finned heatsinks that form the sides of the amplifier s case a 61° rise over the temperature of the room measured with the same device Even the front face of the amplifier was hot measuring 114 and uncomfortable to touch With amplifiers thoroughly warmed up we proceeded to do the formal listening test using the aforementioned Hi Fi News and Stereo Record Review's CD Test Disk III. PHOTO 2: GRAND MOS stereo amplifier rear view. The sounds from the Triphon II and from the reference NAD are remark ably similar on the first listening of this piece. On the Triphon II, Sandra noticed the clear, tonal sound of a block struck by the percussionist during the opening measures of the piece. This sound of the block is dull and not tonal when amplified by the NAD). When the actor begins to recite, the sound is brighter on the Triphon II, with an emphasis on breath sounds. Sandra preferred the sound of the voice as amplified by the NAD), thinking that there was too much “s” sound on the Triphon II. She believed that she was closer to the impassioned actor with the NAD), particularly when he shouts his final command “Play!” John believed that the listener was closer to the actor on the Triphon II, because the breath sounds and “s” sounds were more pronounced. The sound of the trumpet concerto on the Triphon was brilliant. The instrumentation is largely brass and violins, and you felt that you were in the third row. The sound was more muted with the NAD, as if you were in the middle of the hail. We played the selection several times, and John noticed that the harpsichord was barely discernible on the Triphon II. By comparison, the harpsichord was detailed and in balance with the other instruments when played on the NAD. Sandra would rather hear this selection on the Triphon II, where pianissimo passages seemed more intense and clearer than on the NAD). Sandra did not miss hearing the harpsichord (her least favorite instrument), but not hearing it bugged John, who was undecided as to which was the better listen. The sound of the double bass was solid, and roughly the same on both amplifiers. Sandra and John agreed that the sound from the Triphon II is brighter, but not abrasively so. The triangles and other high percussion are crisper on this amplifier. Otherwise, the sound from the two amplifiers is roughly equivalent. The mixture of the instruments does not become muddy on either amplifier. Double bass and drums are solid on both amplifiers. So we did not have a strong preference for either amplifier on this selection. Both were enjoy able to listen to. At this point, we reverted back to the Bob Wilbur - Kenny Davern - Summit Reunion, and played selections “Black and Blue” and “Should I.” Sandra still liked the Triphon II better, be cause of the intense amount of information revealed. She liked the bass, the high piano notes, and the varying qualities of the clarinet as it went from its straining high notes to its thick velvet low notes The Triphon II is a very precise amplifier John preferred the NAD) for its balance John noted however that the guitar was much clearer on the Triphon II and the snare drum and cymbals had more sizzle as well We had not reset the listening levels from those used with the Hi Fi News and Record Review's CD Test Disk III. 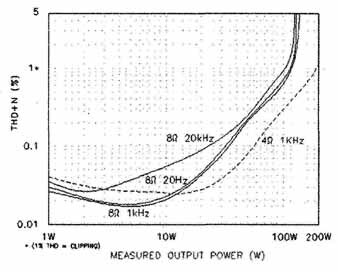 This resulted in an average listening level of 80dB with peaks over 86dB-fairly loud for John s taste This may have skewed his preference toward the NAD which was generally not as bright in the upper frequencies. We next played "Palasteena" on the Summit Reunion disk The bass is clear and solid on the Triphon II if not as resonant and pronounced as on the NAD) Piano passages (with bass and cymbal accompaniment) were very clean on the Triphon II and made the soundstage seem very close The piano was more distant on the NAD) The bass was not as strong on the Triphon II but seemed to have more purity of sound and more detail Sandra preferred the sound of the bass on the NAD and John preferred the Triphon II even though it did not give the perception of deepness that came from the NAD) The final tally on this piece Sandra preferred the NAD) John still prefers the Triphon II at lower listening levels but agreed that it sounds strident at the 80 to 90dB listening level. We returned to the Hi-Fi News and Record Review's CD Test Disk III. The fireworks on La Rejouissance/Handel produced dramatically different results on the two amplifiers. The fireworks are more clearly discernible and realistic on the Triphon II they are colored and muted on the NAD). The difference with which the fireworks were rendered made a lasting impression. Sandra found the lower of the two voices more pronounced on the Triphon II John perceived that the Triphon II had a crisper sound particularly the voices The harpsichord was more distant on the Triphon II than on the NAD) Correspondingly the voices are very immediate on the Triphon II and more distant on the NAD) Again the listener feels very close to the soundstage with the Triphon II and farther back m the audience with the NAD). In the opening passages the straining and urgency of the instruments is very present in the Triphon II It is much less so in the NAD) The female voices are much clearer on the Triphon II and the choir is immediately in front of the listener Playing this selection on the NAD) the listener is in comparison toward the back of the hall. The soprano voices are less detailed. The organ and orchestra are also more distant and there is more resonance in the bass. The crescendos are more exciting on the Triphon II than on the NAD) Sandra and John both chose the Triphon II as the preferred amplifier in this bakeoff. The nature of the sound is different on the two amps. The first short piece is very quiet, and Sandra believed that the unusual percussion effects of this piece were ghostly and mysterious on the Triphon II, and by comparison sounded slightly "electronic" on the NAD. The crescendos on the Triphon II were dramatic but more muted on the NAD. In the aftermath of the final crashing crescendo of the second short piece, Sandra heard pleasant, faint tendrils of sound where she found the NAD sound to lack that detail. As a whole, both amps did a beautiful job on this selection. Both had the ability in the crescendos to move the drums forward toward the listener. So which amplifier would we own if we could have only one Sandra and John both agreed that we would choose the Triphon II The Triphon II even with out the aid of the GRAND MOS amplifier to drive the woofers had sufficient power to drive our speaker system be yond comfortable listening levels. We had an unexpected reality check on our opinion when we attended a con cert at Carnegie Hall the day after con ducting these listening tests The Triphon II with its brightness is more consistent in sound with a live performance in that hail What can we say about the Triphon II's companion amplifier, the GRAND MOS? We are listening to Kenny Day- em on the GRAND MOS as we write, and it is a beautiful full range amplifier in its own right. The cymbals are crisp and bright, at least as bright as on the Triphon II, and the clarinet and tenor sax are well defined. We compared the amplifiers on several selections, and threw in some theater organ for good measure, and found the GRAND MOS to have similar characteristics to the Triphon II, with perhaps not quite the same clarity of sound but slightly brighter with similar soundstaging and ambience. It is far better than I would expect of an amplifier intended to drive woofers alone. We also noted that it did not produce very much heat. It is an excellent match and companion to the Triphon II. John's advice to a prospective Triphon system owner is to first make sure that you have adequate air conditioning for summer use in the listening room as the Triphon II is a real heat generator Also al though we placed it on an open surface we still experienced front panel temperatures too hot to touch comfortably (114° F) even though the room ambient was low. (We had turned off the home heating systems so that there would be no stray sounds in the room) If you keep your audio system components in a cabinet we strongly suggest that you find a place for this amplifier outside of the cabinet. The power supply transformers use a faraday shield between the primary and secondary windings to reduce the inter winding coupling capacitance. Four low ESR computer- type 10,000uF filter capacitors provide the energy reservoir for each channel. Assuming the schematics are complete, I didn't see any DC servo-control or speaker protection circuitry in the GRAND MOS schematic. Since the amplifier is DC coupled from input to output, this could place your speakers in jeopardy if a small DC offset in the preamp output were amplified by the 31dB gain of the amplifier. In case of a shorted MOSFET, only the 15A slow-blow amplifier line fuse stands be tween the considerable output power of this amplifier and your speakers. FIG. 5: Spectrum of 50Hz sine wave. Selectronic recommends that the GRAND MOS be powered 15 minutes before listening. I initially had problems with ultrasonic oscillation in the left channel. I needed to isolate the AC line grounds at my signal sources to achieve stable operation. I operated the GRAND MOS amplifier at 10W into 8-ohm for 1 hour. The heatsink temperature increased to 48°C. The THD reading at the end of this run-in period was the same as when I began: 0.017% in the left channel and 0.021% in the right. Accordingly, the distortion measurements of the right channel are presented here. There is no noise at all when starting up or shutting down the amplifier. Output hum and noise measured 0.39mV (-84dBr, input shorted) and was inaudible with my ear against the speaker. I also measured -54mV of DC offset. The GRAND MOS does not invert polarity. Input impedance measured 15.0k. The gain at 2.83V RMS output into 4-ohm and 8-ohm loads was a high 31.16dB and 31.22dB, respectively. This could help compensate for the low 15k input impedance if a preamp with a relatively high output impedance were used. The output impedance at 1kHz was 0.05-ohm increasing slightly to 0.07-ohm at 20kHz. 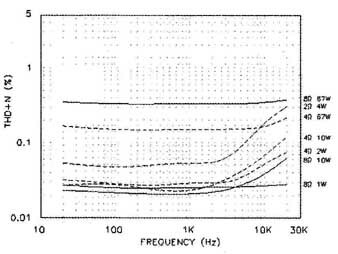 The frequency response (Fig. 1) was within —1dB from DC to 116kHz, at an output of 2.83V RMS at 1kHz into 8-ohm. It wasn’t down to —3dB until 247kHz. There was just a bit more HF rolloff with a 4 ohm load. The response with a complex load of 8-ohm paralleled with a 2uF cap (a test of compatibility with electrostatic speakers) was essentially the same as the 8-ohm load alone. 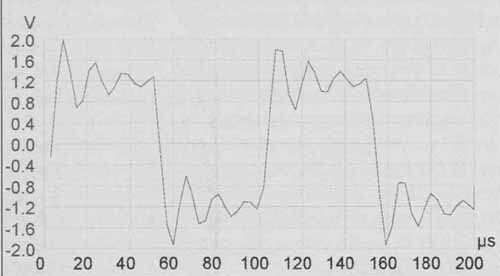 The IHF speaker load, which has an impedance peak at 50Hz, produced no change in the frequency response. 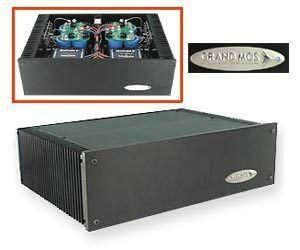 The GRAND MOS amplifier will be insensitive to variations in speaker impedance with frequency. At low frequencies the noise floor limited the excellent crosstalk performance. The dual-mono design assures that minimum coupling occurs be tween channels (see Table 1). THD+N vs. frequency is shown in Fig. 2 for the loads indicated at the right side of the graph. During distortion testing, I engaged the test set 80kHz low-pass filter to limit the out-of-band noise. Figure 3 shows THD+N vs. output power for the loads and frequencies shown in the graph. There was absolutely no strain right up to the point of maximum power. The amplifier, with both channels driven, reached its 1% clipping point at 117W with the 8 load (for 0.68dB of headroom) and 192W with the 4 load. The negative half- cycles clipped just slightly before the positive half-cycles. The heatsinks reached a maximum temperature of 57°C at 67W into 4-ohm. The distortion residual waveform for low into 8 at 1kHz is shown in Fig. 4. The upper waveform is the amplifier output signal, and the lower waveform is the monitor output (after the THD test set notch filter), not to scale. This distortion residual signal shows mainly the 2nd overlaid with noise. THD+N at this test point is a low 0.02 1%. 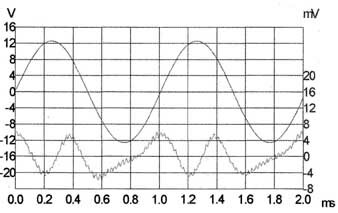 The spectrum of a 50Hz sine wave at 10W into 8-ohm is shown in Fig. 5, from zero to 1.3kHz. The THD+N here measures 0.022%. The 2nd, 3rd, 4th, and 5th harmonics measure —77dB, —81dB, —101dB, and —101dB, respectively. Low- level power supply rectification artifacts are also present at 120Hz and 180Hz. 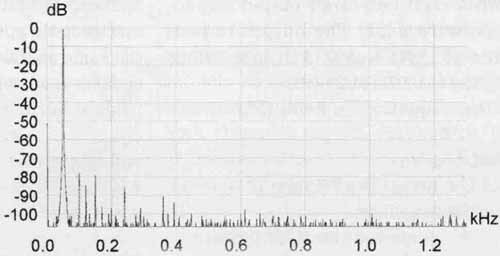 The spectrum of a 1kHz sine wave (not shown) had a nearly identical distribution of harmonics. Figure 6 shows the amplifier output spectrum reproducing a combined 19kHz + 20kHz CCIF intermodulation distortion (IMD) signal at 34Vpp into 8 The 1kHz IMD product is —86dB (0.005%), and the 18kHz product is —81dB. 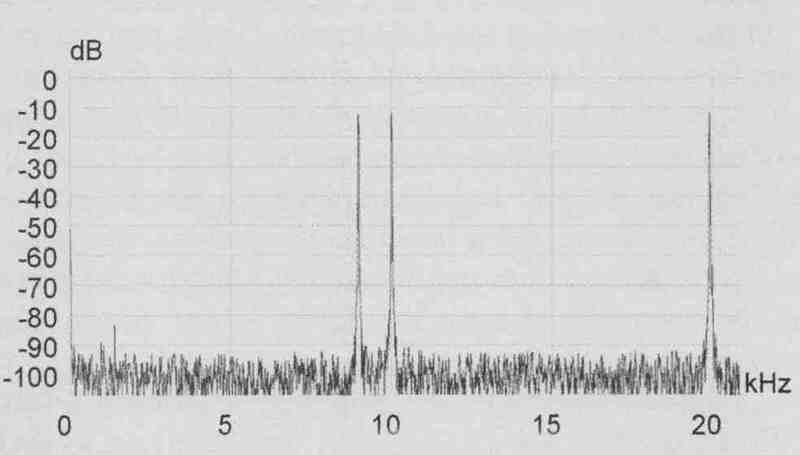 Repeating the test with a multi- tone IMD signal (9kHz + 10.05kHz +20kHz, shown in Fig. 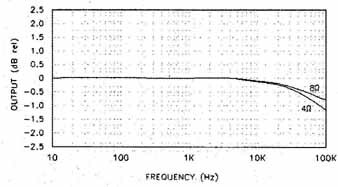 7) resulted in a 950Hz product of —88dB and a 1050Hz product of —83dB. This gives a better indication of the amplifier’s nonlinear response, since it is a closer approximation to music than a sine wave. The GRAND MOS produced excellent IMD results. PHOTO 3: GRAND MOS stereo amplifier interior view. FIG. 6: Spectrum of 19kHz + 20kHz intermodulation signal. FIG. 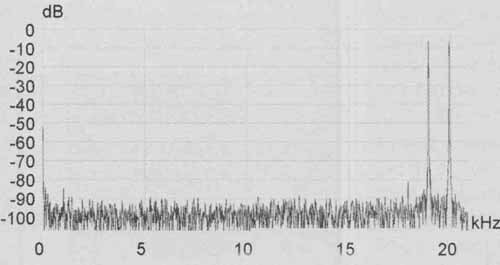 7: Spectrum of 9kHz + 10.05kHz + 20kHz intermodulation signal. FIG. 8: 10kHz square wave into 8-ohm in parallel with 2uF. 1 The oval laminated core of an H type transformer is continuous like a toroid, but has a circular cross section made up of varying widths of grain oriented silicon steel laminations This gives the minimum iron weight for a given core area The winding coil forms are also circular in cross section This allows a shorter wire length per turn and less overall coil resistance.